In a significant development, the Supreme Court on Friday asked Additional Solicitor General Tushar Mehta to address the Court on the question whether National Law Schools can be considered and declared as institutes of national importance, while hearing a Petition filed by Prof. Shamnad Basheer. During the above mentioned hearing, Counsel for BCI Mr. Ardhendumouli Kumar Prasad reiterated that the Bar council of India (BCI) was best placed to conduct CLAT. He, in fact, submitted that the BCI is often criticized, but never given a chance to prove themselves. In fact, earlier last year, the BCI had submitted its response to Prof Basheer’s PIL and strongly contended that it was the rightful institution to conduct CLAT. To this contention, Prof Basheer had responded through a rejoinder stating that handing over CLAT to BCI would be like forcing thousands of students to "jump from the frying pan into the fire". He also strongly denied BCI's claim that it was conferred with the sole authority to regulate legal education in the country under Section 7 of the Advocates Act, 1961. 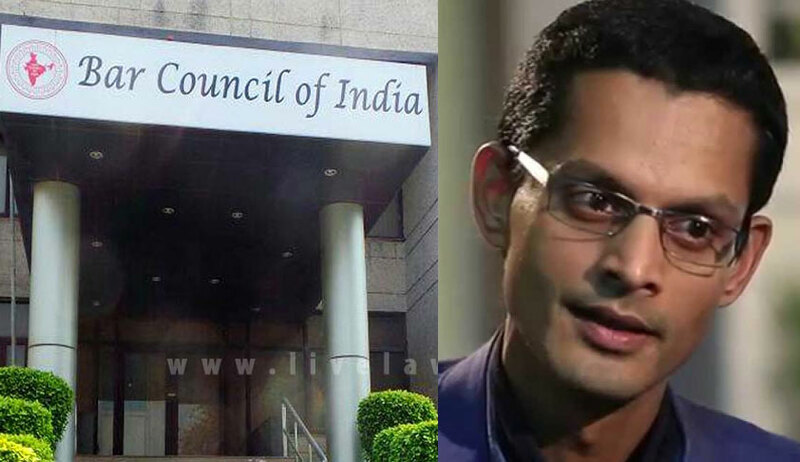 He asserted that Section 7, which lists down the functions of the BCI, ought to be interpreted in its strict sense to merely enable BCI to lay down some norms for legal education in consultation with law universities. Prof. Basheer went on to highlight the fact that over the years, the All India Bar Exam (AIBE) has been conducted in a "grossly sub-standard and unprofessional manner, replete with repeated delays, opacity, maladministration, questionable award of tenders and various other skirmishes". The Rejoinder listed out the delays that have plagued the examination over the past few years, submitting, "Given that candidates have to make arrangements for travel to the select examination centres, this ambiguity and sudden postponement leads to gross injustice to candidates who have to travel a lot (particularly from remote areas) and bear the cost of repeated rescheduling of travel arrangements and professional commitments. Respondent No. 2 has shown complete disregard for these candidates and their futures. More egregiously, the conduct of the exam today reeks of unpredictability and uncertainty, causing significant hardship to many." It therefore contended that entrusting BCI with CLAT would be "sheer injustice" as CLAT is a far more challenging exam requiring the highest degree of competence and professionalism. Given that the BCI regularly announces delays of several months, it submitted that a "similar culture of delay for CLAT would be catastrophic for students and law schools". The Rejoinder further averred, "Respondent No. 2’s [BCI's] gross incompetence and unprofessionalism in the conduct of AIBE over the years are a clear indication of what might happen to CLAT, should its conduct be vested under the regulatory supervision of the BCI. The Petitioner submits that the PIL was filed to redress a highly inequitable and unjust state of affairs, where students were subjected to a rotational CLAT conduct system by participating NLU’s, replete with arbitrariness and incompetence: a state of affairs that impacted their scores, admissions and very futures. To now transfer the conduct of CLAT to an even more egregiously negligent, callous, unprofessional, opaque and corrupt body would be akin to forcing thousands of hapless students to jump from the frying pan into the fire." It went on to highlight several other deficiencies such as the abysmally low frequency of AIBE, and the high exam fee charged by BCI, and submitted that since the Petition demands competence, professionalism, stability, and predictability in the conduct of CLAT, BCI is "hardly qualified to do so". The Rejoinder has been filed on a Petition filed by Prof. Basheer demanding institutionalization of CLAT by establishing a permanent body for conducting the examination. To this end, it seeks intervention of the Court against the opaque and inefficient implementation of CLAT, which is held every year for admissions to Graduate and Post-Graduate programs in the discipline of law offered at the National Law Universities. Besides highlighting several lapses in organization of the exam, the petitioner has also alleged violation of the norms relating to NRI seats at various NLUs, and also a contravention of statutory obligations in so far as reservations of seats for SC/ST and PWD candidates were concerned. As an overall remedy, the petitioner sought constitution of an expert committee to review the working of the CLAT and suggest institutional reforms.